Fresh out of seminary or License to Preach school most pastors enter into vocational ministry feeling pretty well prepared to preach, teach Bible studies, lead theological discussions, and make disciples. But too often they receive their first or second appointment and are thrust into a situation for which they feel completely unprepared – a finance committee meeting. There are no financial classes taught at seminary, and precious few hours are spent on preparing pastors for the administrative side of ministry that awaits. There’s often an expectation of knowledge of budgets and balance sheets, but little preparation in church or personal finance. 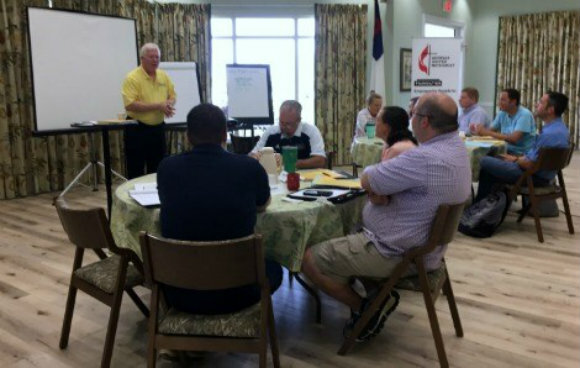 In an effort to better equip and prepare pastors, last week the Georgia United Methodist Foundation hosted 22 ministers at their inaugural Clergy Financial Literacy Academy. The four-day workshop gave clergy practical tools to enhance their ministries and their leadership skills in the financial area. Held August 13 through August 16 at Epworth By The Sea on St. Simons Island, 11 pastors from the South Georgia Conference and 11 pastors from the North Georgia Conference gathered for four days to focus on financial literacy. The seminar included six sessions: two that focused on personal finance, three dedicated to church finances, and one session focused on crises and common church problems. Seminar speakers were Rev. Lawder; South Georgia Conference Director of Administrative Services Dr. Derek McAleer; and Generosity Strategist Charles Buffington, a member of the Georgia UM Foundation board and coauthor of a book on discipleship and stewardship, “He Said It I Did It.” Participants examined case studies and discussed possible scenarios and outcomes rather than just hearing lectures. “We wanted it in a format so that folks could really engage and practice using some very practical tools in order to help their ministry and their leadership skills in the financial area,” Rev. Lawder said. Rev. Joseph Carter, a second-career pastor, is in his first full-time appointment at Homerville United Methodist Church. He says the financial lessons he learned will have lasting impact at home and within the church. During the seminar’s final day, Dr. McAleer led the group in roundtable discussions about various scenarios that can and do affect congregations. Rev. Jean Watson, pastor of Cooks Union United Methodist Church in Colquitt, was enthusiastic about what she learned and is ready to implement a few new ideas at home and with the Cooks Union UMC congregation. In addition to becoming more financially savvy and adding techniques and tactics to her skillset, Rev. Watson says she acquired new resources and built relationships while at the seminar. When she returns home, she said she hopes that these translate into her being a better steward with her own money and then leading her congregation to do the same. “Stewardship is so much more than money,” she said.